Back row l-r: Ed McCosh (Assistant Coach), Sinead Sexton, Gemma Batty, Hannah McCook and Dean Robertson. (front row l-r) Angus Carrick, Andrew Davidson, Marco Iten, Craig Howie and Mathias Eggenberger. Golfers from the University of Stirling celebrated being crowned both the women’s and men’s European Universities Strokeplay Team Champions. 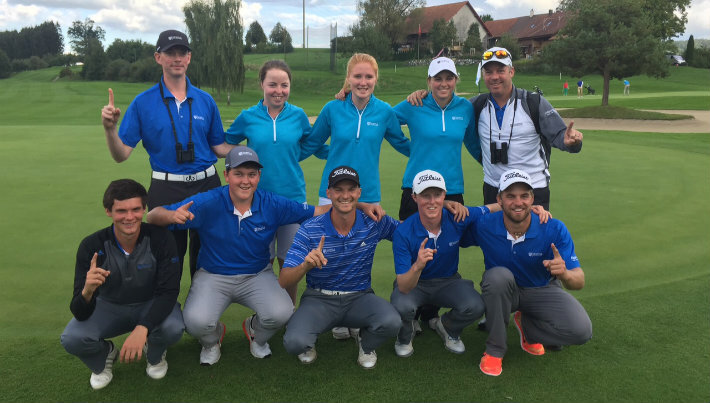 St Gallen in Switzerland hosted the biennial four-round tournament featuring the cream of European student golf. The women’s team edged out defending champions Halmstad University from Sweden by three shots whilst the men’s team took the title for the third consecutive time, finishing 13 shots in front of their closest competition. Irish international Sinead Sexton, from Lahinch in County Clare, shot a final round 68, the second best card of the tournament. It was a Stirling debut to remember for the MSc Sport Management fresher teaming up with World University golfers Gemma Batty, a second year Business and Sport student and summer 2015 graduate Hannah McCook. Sinead, 22, said: “I had five birdies in the final round and nearly had a hole in one at the 17th so it could have been an expensive night for me. It was a great experience, we got on really well as a team and took it one step at a time, not putting any pressure on ourselves. Halmstad had professional players on its team so that gave us extra incentive. The men’s team featured two students from the victorious 2013 side in France, fourth year Sport student Craig Howie and team captain Mathias Eggenberger, studying Business and Marketing. With winning Walker Cup players Cormac Sharvin and Jack McDonald given a well-earned break, the five-man team also featured gifted golfers Marco Iten, Andrew Davidson and Angus Carrick. Craig, 21, from Peebles was agonisingly one shot behind the individual winner, but can console himself with four impressive rounds, including a final round 65. “I was five shots behind the eventual winner with six holes left to play so I can be pleased with the way I finished,” said the 2012 Scottish Boys champion, who made his senior debut for Scotland at the Home Internationals in the summer. Next up for the golf scholarship players is the Macdonald Cup, an NCAA event hosted by Yale University, as they look to finish the season in style. The group photos shows (back row l-r): Ed McCosh (Assistant Coach), Sinead Sexton, Gemma Batty, Hannah McCook and Dean Robertson; (front row l-r) Angus Carrick, Andrew Davidson, Marco Iten, Craig Howie and Mathias Eggenberger.